Eyebrow windows can dramatically improve the look of your home. Blocking light, heat or creating privacy can prove to be a difficult task without the right tools and knowledge. Here are some ideas for making the most of your arched windows and eyebrow windows. If you need to block light coming through your arched window or to control privacy - shop for window shades or blinds. There are many options for arched windows. Since there are so many types of arched windows, ordering custom made window blinds or shades is an easy way to get a perfect covering for such windows. Another option is to treat the arch separately from the entire window. For example, cover the arch with wooden shutters or honeycomb shades and put roman shades, bamboo shades, draperies or another type of window treatment below. 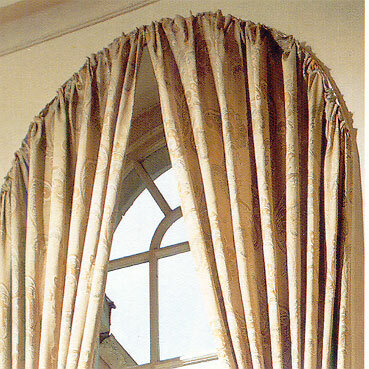 Regular pocket rod window panels can be hung on an arched rod. You can find arched curtain rods here. Once the curtain is hung, you can cut the bottom straight across and re-hem it or use tie backs and let them cascade down the sides. You will want to use extra long panels for this. Another option is the notched right angle pin or hook strip. It has holes in the top to allow you to attach to the window trim or casing and hook tape or drapery pin holes to attach stationary panels. 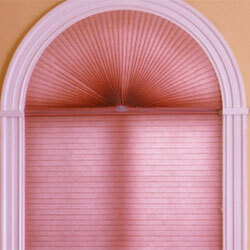 A sunburst window treatment can be created with the clear arch rods. For windows up to 48" in diameter, you need 1 1/2 yards of 118" wide sheers or 3 1/2 yards of 48" wide lace or fabric. Hang tab top curtain panels from antique hooks installed around the arch of the window. Cut the bottom straight across and re-hem. Installing wooden shutters that include a sunburst top that fills the arch attractively is a popular option. Create beautiful simplistic lines with custom shutters. 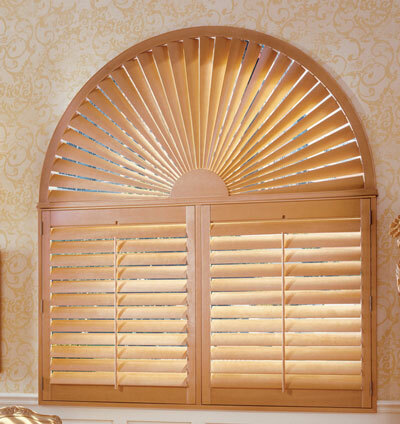 Let more light in by installing shutters or blinds across the window while leaving the arch exposed. 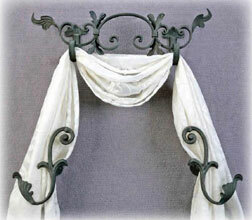 Hang a decorative window scarf in the arched section. Achieve this look by installing three hooks or drapery ornaments. Install one on each side and the third one at the top center or off to one side depending on your personal preferences. Chances are you picked a home with arched windows because you thought they were beautiful. Unless privacy is an issue, why not leave them bare or at least nearly bare. You can add interest or coordinate them with your décor by hanging a simple swag treatment above them or you can place a standing translucent floor screen in front of them to filter light. To give the windows some extra interest when you do not want to cover the window, you can add panels of fabric between or on either side of the windows hung from attractive hooks or window ornaments or short curtain rods.